Article written by MiloBOK, Nirat Anop, Laura B. (Darthlocke4), Claire Serowinski, and Sandi. Edited by Donna Cromeans (@DJRiter). Article prepared for publication by Aimee Hicks. In 1976, a young actress earned an Oscar nomination for her breakthrough performance in a movie based on Stephen King's first novel, Carrie. Today, that actress should be in line to earn an Emmy award for her work in another production based on King's work. The Queen. 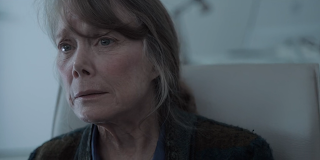 What an appropriate title for an episode of Hulu's Castle Rock where Sissy Spacek's acting royalty shines through. How does she do it, seamlessly flow between dimensions of her mind; past and present? She makes it looks so effortless as she queues between portraying a clear-eyed and lucid young mother; happily talking and laughing with her son to a woman full of fear and turmoil. With any other actress playing Ruth Deaver, it might have come off as exhausting and overwrought, but this sixty-minute episode felt like ten. 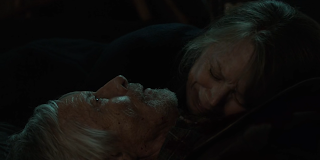 It ended, and viewers wanted more of Spacek's award-worthy, haunting portrayal of Ruth; a strong, determined woman with Alzheimer's disease; perpetually in a state of "when are we?" Her eloquent portrayal of a woman with Alzheimer's leaves the viewer mesmerized and rightfully led her to be chosen as Performer of the Month for August by the staff of SpoilerTV. Spacek's all-encompassing turn in this episode contained a multitude of great acting moments. Many of the standout scenes are discussed in the article below. What should be a happy occasion for Ruth, receiving a Viking chess set from Alan on Christmas, Spacek wonderfully shifts vocal tone and facial expression, as she moves from touching some of the chess pieces preciously in her hands while sitting on the couch, before moving towards the kitchen and forgetting when she is. It starts with a pleasant intellectually stimulating conversation about how the Viking's wife of the priest used to actually carve the pieces out of walrus tusks turning into a small attack on Alan, revealing a deeply cynical emotional edge about her Alzheimer's, as she shrewdly comments, "What else did the internet teach you? That chess is good for the demented brain?". It's as though the chess pieces begin to bring out the worst in her, but Spacek transitions through these emotions with such ease! Memories are a powerful collection of past experiences, they can help us learn from our mistakes, reminiscence what used to be or haunt our every breath. Such information can be forgotten, others too firmly ingrained. Nevertheless, these recollections have a purpose. Ruth utilizing her chess pieces was a brilliant, strategic move, like her mind, they were old and etched with many expressions as if they lived through so much. Watching Ruth grasp each piece, examining it's every detail as if to make a connection was quite subtly impressive. Too often actors just interact with props without much feeling, but Spacek adds something human, something simple by just connecting with these objects. As Ruth hears the voice of herself in a past act she's taken away from looking at the pieces and taken to a homely moment between Henry and herself. The quick exchange of smiles between the two Ruth's, something along the lines of it'll be okay was so heartwarming and coupled with the hopeful score created something truly sublime. Spacek brought so much warmth and love with every glance, every smile, every facial movement throughout this walk down memory lane. The way the scene was directed with an eye towards highlighting her talent, specifically her face able to convey a thousand suns was remarkable. As Ruth places each chess piece around the house like gatekeepers, moving from memory to memory, we are taken to a beautiful scene with Alan and herself. It's very rare to see a love story or any real genuine affection between two older people that is just pure affection so seeing Ruth beam with utter joy was such a sight to behold. She shone in this joyous moment of childlike playfulness were Alan and her transcended beyond the psychical limitations of time. Their age was nothing, their love was the only thing you noticed. The way Spacek has Ruth pause to linger in this scene for longer than any other reverie is notable because it's one of the only times where her character is genuinely happy. To live a life with Alzheimer's is no easy feat, to have this moment to forget about all life's troubles, to be in this moment of pure bliss was written all over her face. The way Ruth's eyes light up with so much exuberance was truly divine, they say the eyes are the windows to your soul and at that moment you could see hers was at peace. Seeing Ruth explain to Wendell about the chess pieces helped to give context behind their usage, and coupled with Ruth realizing what she needed to do in order to overcome her demons after being told by Wendell the objective of the game, it showed that even the quieter moments of The Queen were still incredibly important ones, with Spacek giving it her all and commanding the screen. Spacek was simply incredible in this scene, getting the most out of a reaction to what could have been a simple, shoe-horned in reference to a VR game in a bid by the writers to make the show feel more relevant. Later, angry and in a panic, Ruth spills her pills all over the floor trying to pick them all up, when seemingly Matthew cooly walks in and tells her, "Go to bed, Ruth!". Clutching the pill bottle in her hands close to her chest and slowly rocking, Spacek's confused expression is no doubt matched with the audience's, as the next shot reveals that it is not Matthew, but the Boy! She slowly turns, as she watches him wash the dishes, hearing a long lost sermon, and gravitates towards the voices on the TV in the other room, which reveals that Boy just burned down Juniper Hill Hospital! She looks back towards kitchen and gasps, "Matthew. ", believing Matthew and the Boy are one and the same. She goes to her closet to get a gun, her fingers meticulously clutch its handle, as she pulls it down towards her, but realizes there are no bullets! She briefly fumbles through the closet with no luck, then quickly turns off the lights! Everything instantly black. With so little words Spacek conveyed the fear Ruth felt, but also a kind of controlled smartness of being able to slowly back away from the danger, but not without out the intensity of Ruth's resolve to do something about this now! The fear that Spacek so beautifully portrays is not even a fear of her illness, but above all: her long-dead husband, Matthew. She is sure that the kid (Bill Skarsgad) is a reincarnation of him. When Molly shows up at her door to warn of impending trouble, Spacek quickly steals the scene when she tells Molly she knows that Molly killed Matthew. With one look and one line, she absolves Molly of all guilt and she says the line in almost a whisper, making it even stronger: "you did right." What a powerful statement and the look of pure gratefulness in her eyes made everything better. From this scene, she floats into a scene where she VERY hesitantly dances with the kid. Her palpable fear of his man she believes to be her husband, but in another dimension is actually her son is again all played out on her face and her stilted movements. Though the viewer is sure the Kid is going to kill Ruth, Spacey actually evokes nervous laughter from the audience watching her tiny frame dance with the six plus foot tall Bill Skarsgad. She jumps from this scene to a scene with the young Sheriff Pangborn in the past, where he passionately begs her to leave town with him to a scene (from the past) that has her finding rat poison and realizing what her husband has done to their beloved dog. She continues calling out for the dog or looking for bullets (in the present) to the gun to protect herself from "Matthew." She never loses hope, never stops fighting. Fear is a powerful weapon, it can make you do things you wouldn't think possible. When Ruth attacks The Kid with the screwdriver, the sheer fear that led her to that moment is explicitly present in her body language. She's so careful with her breathing, not to give herself away, her eyes are wide and attentive, she feels the danger of her situation, she looks trapped. She stands unwaveringly still in the bathtub despite the water overflowing out of it. It's evident she's terrified in the way she grips the screwdriver tight, close to her upper chest, with it gradually being pointed towards the shower curtain. As The Kid continues to taunt Ruth, she asks who he is, he replies "I am smaller than a teacup", pretending to be her son, Henry, and slowly peeling away the shower curtain only made her fear exacerbate. The very fact she drops the screwdriver immediately after stabbing him and running out of the room shows she just wants to escape. She has no malice, she doesn't keep it, she doesn't want to keep fighting, she just wants to feel safe in her own mind. Ruth is so lost and vulnerable and Spacek evokes that effortlessly as she pushes through the quicksand of her past. The first woman she sees upon leaving the bathroom utters "you're still young, you'll remarry" is met with absolute shock. Her face is etched with even more fright. She escaped one ghost (The Kid whom she thought was her husband because of his manipulations and her confusion) to only fall further into the ghosts of her past. The way the camera follows Ruth as she struggles with all her might, pushing against them is exceptional. The sense of claustrophobia in the scene, the heightened laughing, the distorted use of "Come Fly with Me", and the closeness of people against Ruth (making her fight for her life, fight to get out), the darker lighting in the hallway, the camera being unfocused, as if in a daze and the unexpected bright camera flashes evoked extreme trepidation. Seeing Ruth tilt her head up towards the ceiling to catch her breath as if she was swimming and started drowning was superb. The entire hallway scene was a technical marvel to behold and Spacek's performance elevated it from the moment she ran out of the bathtub. When Ruth finally shuts the door and escapes the phantoms her breathing is quick, she's nervous, her head is tilted upwards as if towards a higher power as if it's a cry for help. Her head is also always near the door, her state of worry never truly leaves her. When she finally starts dropping her head the sun starts to come out as if the darkness is finally over. Seeing Ruth watch herself relive her most tragic remembrance - pack her suitcase and gun and give up, not having the heart to leave Matthew - was soul shattering. The camera concentrates on a distraught Ruth begging herself to leave with so much conviction it's impossible to look away. The sheer emotion in Spacek's voice makes the audience feel her plight, you hear the pain in her voice, the melancholy tone, her sense of entrapment in an emotionally abusive marriage, one where she isn't able to break the cycle. One where she has, like clockwork, packing up her suitcases, ready to leave but then ultimately unpacks it all because she's afraid. She has doubts and the mind plays on those uncertainties like wildfire. Spacek's performance echoes the suffering of so many people unable to help themselves, unable to escape, unable to find the strength and courage within themselves to free themselves. There are clear tears welling in Ruth's eyes. Her voice trembling as she begs herself to "leave him". When she says "please", you feel her desperation and heartache because she knows the answer to this question, she knows she can't change the past despite wishing she could in this very moment. It's noteworthy that Ruth's voice, the uttering of "leave him" becomes progressively louder with each time she says it as if she's swallowing her fear and gathering the courage to stand up and strive for herself. Through it all Ruth 's face is painted with tragedy, you can see her despondency and it feels all too real. It never once feels like Spacek is acting, it just comes way too natural to her, it feels genuine, never once scripted or acted and that's pure talent. When Ruth finally moves her face from looking at the back of her past self who has given up on trying to leave, she's taken by the sunlight towards the shelf where a chess piece sits. The way the sun shines, acting as a beacon, helping her find her way out of the maze was poetic. Ruth's frantic shaking of the chess piece, the frustration in her cries, hoping that by shaking the object it'd pull her out of this painful memory is utterly tragic. There is never a moment where you aren't compelled and entranced by her performance. So often in movies and tv shows, people are haunted by their pasts, but the emotional vulnerability she brought in this scene was unparalleled. To be haunted by this memory for so long is such a burden to carry and it's taken its toll on Ruth, it's more than clear at this moment. It's only when the dog suddenly, out of nowhere, barks at her hysterically does she shriek out of shock and is pulled out of her regret and into a moment of grief. Another unusual, but standout scene, of her having taken hold of her grounding chess piece Spacek's character hasn't been brought back to the present this time, but to a wake which is being held in the Deaver house, although it leaves some interpretation open to the viewer as to whose it is. Director Greg Yaitanes rightly allows the actress room to take her time during this scene, keeping in tune with the usual somber feel of these occasions, while Spacek gives an understated, yet heartfelt performance as her character attempts to understand her surroundings. She uses the subtlest of facial expressions to portray her apprehensions over who may be in the coffin, suggesting that this could be a period of time that she is not familiar with or that she has perhaps blocked it completely from her memory until now. There is an obvious feeling of being unsettled by the whole situation in Spacek's body language as she leaves the scene behind her to get a drink of water in the kitchen and mull it over. Suddenly, viewers are snapped back to firmer ground as the scene shifts to what appears to be a flashback with Matthew (Adam Rothenberg) and young Henry (Caleel Harris) coming home after one of their trips in the woods. Spacek has so many defining moments in "The Queen" but perhaps this is one of her greatest as her character finally works out the crafty clues that have been slowly clicking into place throughout the episode. When Matthew breaks from his historic role and starts questioning Ruth about Doctor Vargas, she effortlessly transitions from a confident, defiant woman about to leave her broken marital home, to confused patient hallucinating two realities, to trembling wife cowering beneath her domineering husband. Yet at the same time, Spacek is showing us that this is the breakthrough her character requires to work through the problem of where the bullets are in the maze of her mind. The fear from all those years ago which made her want to leave this man is etched all over her face, but alongside it, there are flickers of defiance and then the dawning recollection that she never unpacked them from the suitcase. In a lesser actor, these ever-shifting emotions could easily be lost or overemphasized to the point of distraction, yet Spacek keeps the viewer immersed as she takes us through every twisting turn Ruth Deaver's mind makes throughout this scene. The slow-burning suspense that led to this climatic moment brought out an emotional performance from Spacek, who didn't immediately know that she had shot Alan until after it had happened, finding out with the audience. It was a tense moment because it was inevitable that something was going to happen, and Spacek got the best out of her delivery in a scene that gave her few words to speak, relying largely on her facial expressions and her ability to show emotions. Will the use of On the Nature of Daylight ever not herald the arrival of an incredibly emotional scene? It's a brilliant score, and as we finally learned the context behind the words "Don't Leave," it really helped set the tone which Spacek was able to make the most out of. It will be hard to hear those two words without thinking back to this scene in the future thanks to just how powerful and heart-breaking Spacek's delivery of them was, and thanks in no small part due to her legendary performance, it has to go down as one of the finest scenes of the year to date. 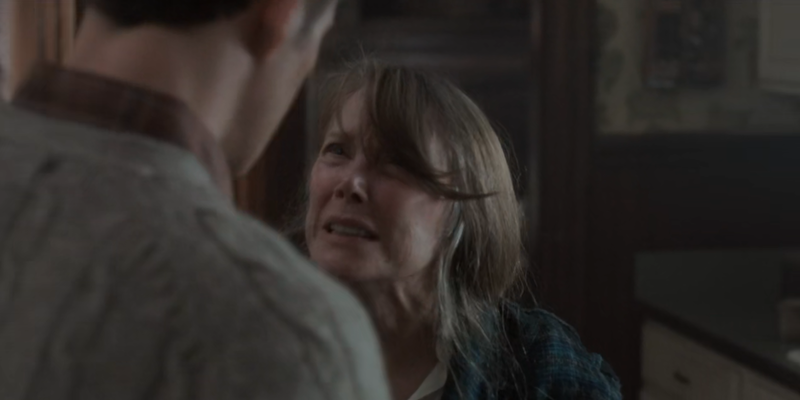 Throughout the episode, Sissy Spacek was simply mesmerizing. She conveyed feelings with one gesture; covering up her upper body with her arms while in the bathtub, a beautifully subtle movement. So much of what her character was enduring showed in her eyes and facial expressions, she didn't need to speak a word. She is constantly volleying between past and present; always just vaguely aware that she isn't ‘when or where' she is supposed to be? By showing this sides of her character's dementia, Spacek is almost helping the viewer to maybe understand this illness and all the pain involved and all that it steals from everyone affected by it. She seems to be giving us an ‘insider's view" of dementia. 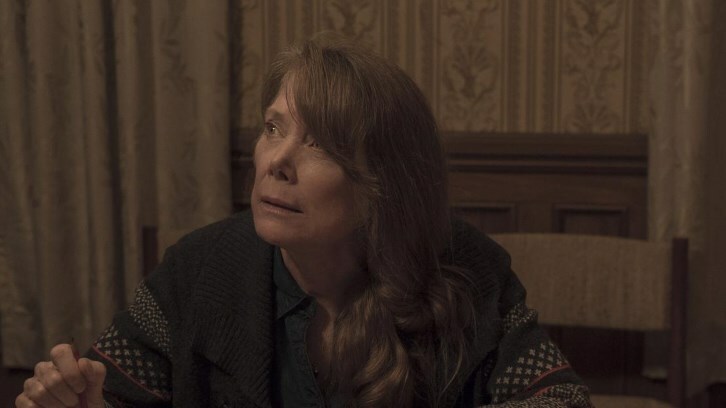 With this mastery of her craft in this tour-de-force hour, Sissy Spacek will likely be garnering attention for yet another iconic Stephen King character. Her name should certainly be mentioned come award season. She easily deserves this month's honor as SpoilerTV Staff Choice for Performer of the Month for August. This article covered much of SpoilerTV's staff's favorite moments from her magnificent work in The Queen episode of Hulu's Castle Rock, what were some of your favorites. Discuss in the comments below.